Coca-Cola Enterprises added some festive cheer to its 1.75 litre bottles in December 2015 with an innovation allowing consumers to transform the bottles’ wraparound labels into a neat decorative bow. Consumers could peel away the bottle label to reveal a tab that, when pulled, forces the label to contract and form a bow shape on the front of the bottle. 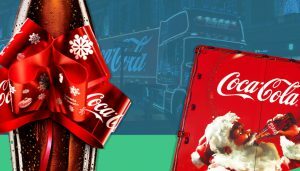 Available across the four key variants of Coca-Cola, Coca-Cola Zero, Diet Coke and Coca-Cola Life, the brand’s marketers hoped the festive format would help retailers to drive seasonal sales. The novelty pack adds something special to the table when hosting festive get-togethers, a point that expert judges agreed with at the twenty-sixth DuPont Awards for Packaging Innovation in 2016. The Coca-Cola Christmas Bow Label earned a Silver Award for excellence in Enhanced User Experience. The DuPont Award recognised the science as well as the innovation. The design also demonstrated a creative design execution by using a modified roll-fed label that is distributed through the normal supply chain in flat form and then easily turned into a bow when the consumer pulls a tab. It can be flattened back out and reformed numerous times, allowing multiple consumer experiences. The label was produced using a combination of high speed flexible printers and more specialized narrow web printers and the judges were impressed that the innovation was completed cost effectively and without impacting the high speed bottling operations. This project worked at the edge of, but within, the technical capability of bottling equipment by adding the complex production/conversion process to the packaging production supply chain. The new format was supported by in-store point-of-sale material and the launch of Coca-Cola’s “Give a Little Happiness” television advertising campaign, with a ten-second homage to the new bow design. The new advert incorporated the iconic Coca-Cola Christmas truck to deepen the brand story, drive engagement and help retailers to maximise their sales during the holiday season. In February 2016, Coca-Cola posted better than expected profits and revenue in its fourth quarter as cost cuts helped a challenging economic climate. Diet Coke sales fell five percent but sales increased for Coke (1 percent), Sprite (3 percent) and Coke Zero (7 percent). The company also announced that it expects to refranchise its North America bottling operations by the end of 2017, three years earlier than expected. The beverage giant is targeting 3 billion dollars in cost cuts by 2019 and these measures have helped stem the damage from global market challenges, including the strength of the dollar. In an effort to spur sales, the company has been experimenting with smaller beverages, including mini-cans and 8 oz. glass bottles, a strategy that appears to be a success at the end of 2015. Coca-Cola has also increased emphasis on non-carbonated beverages and has seen success. During the final quarter it saw an 8 percent rise in packaged water, 6 percent growth in tea, 5 percent growth in juice and juice drinks and 2 percent growth in sports drinks. Coca-Cola states that it can reach its 2016 target of 4 to 5 percent organic revenue growth, though this has been met with some skepticism by analysts. Coca-Cola said the revenue growth rate was 4 percent in the first quarter after removing ongoing bottling divestments and foreign-exchange losses. Coca-Cola has stepped up its soda marketing throughout 2016 as it redirects savings from its cost-cutting program and also hopes to report benefit from its sponsorship of the Brazil Olympics in 2016.